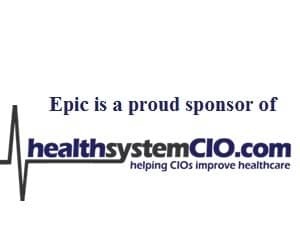 Rolling out Epic across an organization the size of St. Luke’s isn’t a project; it’s a journey that requires an enormous effort to stay on course. It also requires a lot of change, and when that becomes too much, leaders must be willing to hit pause. It’s precisely what CIO Marc Chasin did three years ago, and the result was a more standardized, collaborative approach. In this interview, he talks about how his team is looking to optimize and stabilize its EHR, the federated approach they’ve adopted with data warehousing, and the ultimate goal with patient engagement. Chasin also discusses the application rationalization process, the two types of CIOs we’ll see going forward, and what he hopes to accomplish as a member of CHIME’s Board. Where I see the main gap is not in the capture of information or the technical connections that need to be made; where I see the main gap is the ability to pull out the appropriate patterns that these devices are providing. What we’re running into now is, as you participate in a risk-based contract, not all of your partners are on the same portal, or even the same electronic health record. We can solve the differences in EHRs with interoperability, but we need to look for a way to consolidate our patient portals. It’s easy to turn them off. What’s not so easy — and I’m finding it rather difficult and complex — is what do we do with all the data that is inside these records, and once we migrate the data to a centralized repository, how can we serve this up to a clinician or another end user that needs access to the old record. This individual, I believe, is going to be a disruptor to an organization. They can clearly see the vision of how technology can enable the organization and how we can improve care, how we can make it more efficient, how we can make the patient experience better, and reduce overall cost. Gamble: When you look at that patient engagement piece, there’s a lot more interest than ever before in things like wearables. What are your thoughts as far as being able to incorporate that data? Obviously, it’s easier said than done. Chasin: I think you’re referring to the Internet of Things. It’s imperative that we start down that path of and incorporating these consumer devices, whether it be the Fitbit or the Apple Watch or sleep monitors. Where I see the main gap is not in the capture of information or the technical connections that need to be made; where I see the main gap is the ability to pull out the appropriate patterns that these devices are providing. There is no way that as a physician, they’re going to sit and sift through 500 lines of pulse capture or the amount of steps that you have walked. We need to ingest that into our data warehouse. We need to develop some machine-learning capabilities, and have the computer work through and point to areas of concern for the physician or for the care coordinator — or even, if you take a step back, look at a whole entire population that has these wearables and see where there are opportunities to improve care from that perspective. So I see it in two layers. I see it at the individual patient level, and I also see stepping back and looking at all this data from a population perspective. Gamble: When we spoke a few years ago, you talked the goal at that point of getting to one portal instead of multiple patient portals. What’s happening now with this? Chasin: We are on one single patient portal, which is great. However, what we’re running into now is, as you participate in a risk-based contract, not all of your partners are on the same portal, or even the same electronic health record. We can solve the differences in EHRs with interoperability, but we need to look for a way to consolidate our patient portals, because we don’t want our patients to have to go to four or five different portals. I’d like one portal for one network member. We’re working on solutions in that area, but I think the patient portal is just one aspect. We really need to drive this down to a mobile application — one that is easy, and one that can serve multiple needs, whether it be accessing their electronic health record, accessing a consult on the go from a nurse or a physical therapist, or even the patient’s ability to look at their medications, participate in their care and upload it. There’s a lot more dynamics that need to happen with that. Gamble: Right. I’m sure that from your perspective it’s been really interesting to see how quickly all of that seems to be evolving as far as how patients interact. Gamble: Now, when you talked before about the stabilization efforts with the EHR, you mentioned the workflows and all the work that had to be done there. How big of a role do the clinical leaders play, and do you have a specific group that focuses on that? Chasin: Sure. It’s completely clinical. The way that we’ve built out what we call “MyStLuke’s” is that it’s a clinical transformation project with information technology support. My team understands what the optimal workflow can be, but it doesn’t provide any context unless there is a clinician. And when I say clinician, I mean a nurse, PA, NP, physician, dietitian, or diabetes educator — anyone that’s treating a patient. Our stabilization work is being driven by our clinician partners. They’re the ones that raise the issue. They’re the ones that identify the problems within the record. My team then partners with them to really look at what is the most optimized and the most optimal way of solving that issue. It may be a redo of a current technological workflow, or if the technology is running as streamlined as it should be, the clinician or clinician group may need to change their workflow. At St. Luke’s, what I’ve been the most pleased about is how integrated the technology side is with our business partners. We’re no longer looked as a different group; we’re looked at as partners in the delivery of care. Gamble: Right. That’s so critical, and it’s something that can’t just be lip service, but has to be really in place. Gamble: Okay, so we’ve talked about a lot of projects. Anything else that’s one of your big focuses going forward? Chasin: Yes, two things, which are probably on a lot of people’s minds. One is now that we’ve gone live with an enterprise electronic health record, we’ve got all these other applications that we need to retire. We are going through an application rationalization process of winding down the applications that we are no longer using. That’s become a bigger issue than I thought that it was going to be about a year ago. While we have all these applications, it’s easy to turn them off. What’s not so easy — and I’m finding it rather difficult and complex — is what do we do with all the data that is inside these records, and once we migrate the data to a centralized repository, how can we serve this up to a clinician or another end user that needs access to the old record. So we’re working on that. Another big issue that we’re focusing on is cybersecurity. We have done and we continue to train our end users on how to recognize a phishing email, how to investigate it, how not to give your username and password to any other site but those within St. Luke’s. That’s an ongoing challenge we’re working through, because it’s not if you get breached — we’re in the environment of when you get breached. We need to make sure that our policies and our procedures are robust enough and agile enough for us to quarantine or identify any breach in our network. Gamble: Do you have a Chief Information Security Officer? Chasin: I do. She is fantastic. Gamble: How long have you had her? Chasin: I’ve had the role already for two years. My first CISO got promoted within the organization; so I am now in the process of building my next one up. Gamble: Okay. Obviously, a pretty important role to have. Chasin: It is an important role. Gamble: Another thing I wanted to touch on was that you just started a term with CHIME Board of Directors. First of all, congratulations. Gamble: What was it that made you want to be part of that and what do you really hope to achieve? Chasin: I hope to give back to the organization that I felt has been a resource for me for all these years. I have met so many mentors and colleagues, and I really felt that I wanted to give back to this organization, not only from a policy perspective but also building out the educational opportunities and mentorship that it has given me over the past 10 to 15 years. Gamble: With the people who are heavily involved in CHIME, there really seems to be quite a range as far as experience and areas of interest. I’m sure that it’s beneficial to have someone coming in with your clinical experience. Chasin: I hope so, and I am going to continue to be an active participant through my years of commitment, and after that. I plan to participate even after my board term expires, but I’d like to continue to bring the clinician perspective into the decisions and the educational programs that CHIME continues to offer. Gamble: It’s really interesting to me to see how the CIO role has evolved even in the last few years. How do you think it’s going to evolve going forward and what are the traits you think CIOs are going to need to exhibit? Chasin: That’s a great question. I do believe that there are two types of CIOs going forward, and each one is critical to the organization’s success. The first type of CIO is more the technical type role. That CIO is going to make sure the lights are on and the infrastructure and network is running at the highest quality and lowest cost, and driving that as a service provider. I think that’s a role that is specific to an individual CIO, and one that has a lot of growth to it because technology is changing. The way technology is deployed is changing, and the virtualization of applications is ongoing and changing. So that service provider role is key to making a transparent and end-user-friendly environment. Then there’s the other type of CIO that I view as more of a transformational CIO. They’re the CIOs that have been clinicians, whether it be a nurse or a physician or any other clinician that has risen up, and has the aptitude, and likes the technology work — that convergence of care and technology. This individual, I believe, is going to be a disruptor to an organization. They can clearly see the vision of how technology can enable the organization and how we can improve care, how we can make it more efficient, how we can make the patient experience better, and reduce overall cost. This CIO is to be perceived as an operator — not a technical person — who understands how the business runs, and understands the pain points. It can relate to the end user and understand the why and understand how to rectify this. I do see that role changing over the next three to five years into those different types of segmented roles. Gamble: Very interesting. And of course you’ve carried the CMIO title too. It’s been interesting to see how that role too is evolving and will need to continue to as we move forward. Chasin: Right. That is an excellent question. I see my role in four different buckets. I have to oversee cybersecurity, which is a huge risk in the organization. I look at general overall IT operations, which is keeping the lights on. My role today has the CMIO role in the clinical area, and then I look at BI and advanced analytics. In my organization, I think we did a really good job in implementing Epic over the last six years. What’s happening is that as our EHR is evolving, my clinical partners are leaning toward having a CMIO that has much more of a day-to-day clinical involvement. So I’m in the process of developing a CMIO role that is actively clinically practicing. With that in mind, my CIO role takes on a different function. While I will still have cybersecurity and look at the overall IT department and operations, what I’m really starting to build out are the advanced analytics and machine-learning areas as well as an innovation area of disruptive technologies, and partnering with tech accelerator programs and trying to see how we can innovate and drive to more efficient care at a lower cost and at a higher quality. Gamble: And you’re part of the CHIME CMIO Leadership Academy, right? Chasin: Yes, I will be teaching that in early April. Gamble: I would think that’ll be interesting seeing the different perspectives from physician leaders and for those who are working toward that. Chasin: This is my fourth year doing it. I really like the mentorship and the collaboration, not only with the faculty, but the students that attend who I have kept in touch with over the years as they’ve developed and moved on. It’s a nice small group that we keep in touch with. Gamble: All right, I think that that covers what I wanted to talk about. Thanks so much for your time. I’m sure I’m going to be in touch again, this time in less than three years. We’ll have more to talk about I’m sure. Gamble: Thank you so much, and I’ll talk to you soon. Chasin: Thank you. Have a good day.